BP + PRISM success story in numbers. More than 25,000 BP America employees and retirees completed a Health Questionnaire. That’s a whopping piece of a health pie – more than 80% of eligible employees. More than 10,000 made a Health Advisor call. More than 21,000 enrolled in a new health option medical plan known as HealthPlus, where they must earn wellness points to remain in the plan. More than 92% of the HealthPlus participants earned 1000 wellness points. This is a new benchmark for the industry; outside consultants expected only around 60% would complete the 1000 point requirement in the first year. 90% of employees and spouses/domestic partners completed a Health Questionnaire and are enrolled in the HealthPlus medical option for 2011/2012 plan year. 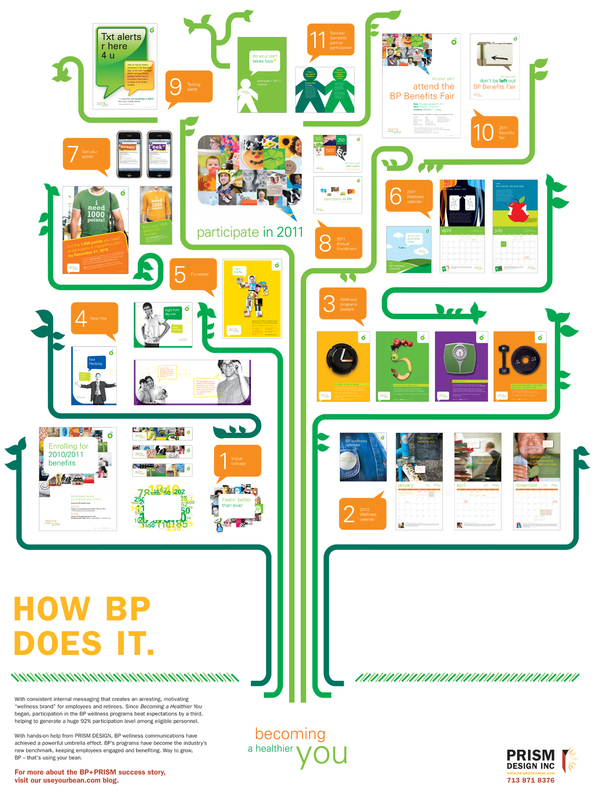 BP is developing a culture of health. They have adopted programs that encourage everyone to become healthy. Can you influence behavioral changes in your employees? Going by the numbers, we’re heading for success. This entry was posted on August 12, 2011 at 9:22 pm and is filed under Branding, Employee Communications, graphic design, Uncategorized. You can follow any responses to this entry through the RSS 2.0 feed. You can leave a response, or trackback from your own site.